This scholarship program is designed to sponsor outstanding, community engaged students to attend university who otherwise would not have the opportunity, thereby, fostering the development of future Sub-Saharan African leaders and entrepreneurs. This application is for MASTER’s (non-thesis) applicants only. A central goal of the Mastercard Foundation Scholars Program is to create a globally educated and highly qualified group of future leaders, who, upon graduation, can return to Africa to help foster the region’s development. This application is for MASTER’s (non-thesis) applicants only. You must be nominated by a professor of a recognized Mastercard Foundation Partner University, or be nominated by a current McGill Professor or Staff Member (see the 2019 Nomination Form.pdf). The Mastercard Foundation Scholars Program provides access to secondary and higher education for young people who are committed to giving back to their communities. It is designed to provide students with holistic support. 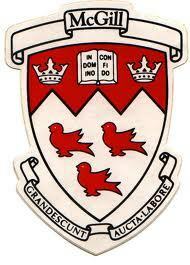 McGill University (French: Université McGill) is a public research university in Montreal, Quebec, Canada. It was established in 1821 and bears the name of James McGill, a Montreal merchant originally from Scotland whose bequest in 1813 formed the university's precursor, McGill College.